Talib Kweli is a busy man. He had two albums come out last year, solo effort Gutter Rainbows and his group Idle Warship‘s debut LP Habits of the Heart, and began recording/touring with Yasiin Bey.. -ahem- Mos Def as Black Star again. Look out for a new Kweli album, Prisoner of Conscious, to hit stores soon. Check out PoC‘ lead single, “Distractions,” in music video form at the bottom of this post. Also, stay tuned for the follow up to his 2007 collaborative LP with Madlib, Liberation. 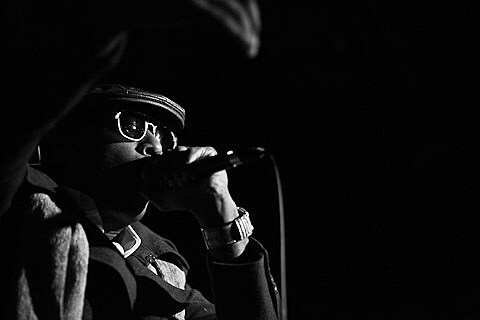 On April 25, Talib Kweli will hit Chicago for a full band performance at The Shrine. Advance tickets are on sale. In related news, Kweli’s Idle Warship partner-in-crime Res will be at The Shrine on April 5 to host a local talent showcase. Res and Kweli will head to Austin this coming week, performing at SXSW as both their respective solo projects and as Idle Warship. Music video for “Distractions,” below..